Fond as we may be of the oddly Wu-Tang shape of Papa John’s jack-o-lantern pizza, we have, at the 11th hour, discovered the clear winner of 2018's Best Silly Novelty Halloween Food Item. Take a seat, Nightmare King. Best of luck next year, doughnuts delivered by scary clown. 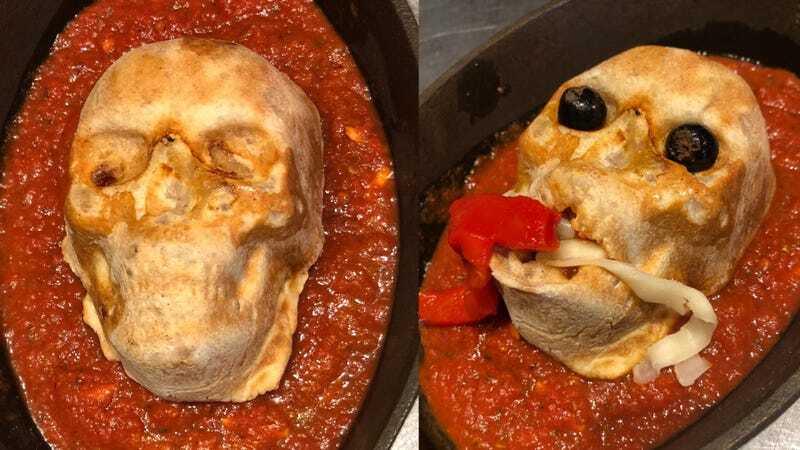 The obvious and deserving champion is this Skull Calzone, the creation of St. Louis’s PW Pizza. The Lafayette Square pizza joint—which, important info first, is open until 9 p.m. today—succeeded by keeping things simple. Skulls are creepy. Dough can be baked in shapes. Olives are black. Red sauce is.... red. Bingo bango. It also looks a little like the Dark Mark, so that’s kind of cool. We know that only Parks And Recreation’s Ben Wyatt is super into calzones, but figure this one is worth the exception. That is a champion novelty foodstuff, and if you are in St. Louis, you should eat them. They’re $3.99 and, as far as we can tell, available today only. Get there.